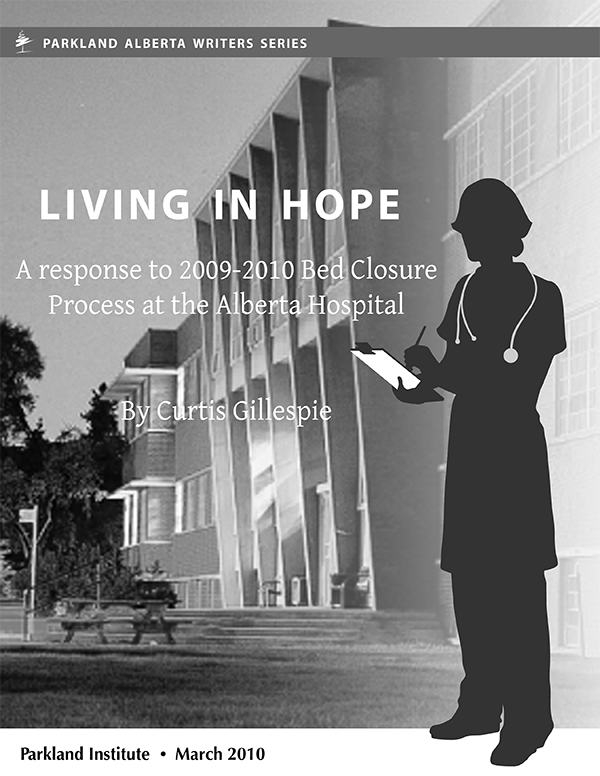 This essay is a response to the Stelmach government's proposed closure of 246 beds at Alberta Hospital Edmonton (AHE), a plan made public August 14, 2009 (called Plan 246 for the purposes of this essay). In early 2010, the government announced that only the geriatric beds would be moved from AHE. The fate of the hospital remains uncertain and the facility is in need of significant investment in maintenance and upgrading. This essay considers key aspects of the issue: how are mental health policy decisions being made in Alberta? Is there an adequate number of high-quality acute care mental health beds in Alberta? And, in conjunction, are the levels of services in the community adequate? The closed door decision to remove these beds from AHE and redistribute them without a detailed plan provides an important window into how the Alberta government views mental health, and is a critical backdrop to the current debate. The Stelmach government encountered heavy criticism for both the Plan's philosophical underpinnings and the seemingly scattershot method of its implementation (or, at best, its scattershot consultation and communications strategy). The decision indicated that mental illness is not treated with the same level of service and care, and dignity, afforded other serious illnesses. Mental illness, including suicide, accounts for fully 15% of the burden of disease in established market economies. This is more than that caused by all cancers. 20% of all Albertans will suffer from a mental illness during their lifetime. In 2002-03, over half a million Albertans were treated for a mental health issue. Over that same span, those half a million Albertans made an average of five physician visits each in which mental health was the primary purpose for the visit. In 2001-02, some 34,000 Albertans visited, or were taken to, a hospital emergency room for a mental health crisis. Alberta ranks low in the number of acute psychiatric beds per capita when considered against various jurisdictions. The province has just 45 beds per 100,000 population, compared to the EU average of 100 beds per 100,000. Prior Mental Health reviews have raised this issue for the Alberta government and recommended against bed closures. The 2007 McDermott Report, commissioned by and submitted to the Alberta Mental Health Board, stated that, "reductions in bed numbers would also not be appropriate at this time," especially given the low bed numbers. The McDermott Report advocated for the adoption of Balanced Care Mental Health, a sensible and patient-focused mix of Primary Care, Mainstream Mental Health, and Specialized/Differentiated Services. This included increased spending on community mental health. The report noted that whether beds were moved from AHE or not was irrelevant at best, and harmful at worst, if there wasn't proper funding for community options. Australia has been embroiled in controversial mental health policy, which has seen a reduction in mental health beds in public hospitals by 80% in the last forty years (1965-2005), from 300 beds per 100,000 population, to 30 beds per 100,000 population. According to numerous studies, as well as reports from psychiatrists and even government officials, Australia's deinstitutionalization policy failed to ensure those needing mental health care got the right support when they needed it, support that would have been linked to better mental health outcomes. Accordingly, this policy failure has resulted in the chronic blocking of acute hospital beds by patients who cannot find proper treatment and care in the community, a drop in the quality of therapy in those acute wards, a poor quality of life for patients with severe disabilities from their mental illness (whether in hospital or not), and a demoralization and skill depletion in staff who work in the remaining long stay care environment. Australia's aggressive deinstitutionalization policy has been termed a "policy failure" by many of the country's psychiatrists, since it has failed to properly provide for patients severely and chronically disabled by mental illness. Some Australian psychiatrists have even called the policy a "blight that will come back to bite patients and their families for many years to come." It appears that in Australia the pendulum has swung too far, past eradicating the Victorian era asylum, to an "equally destructive approach which minimizes admissions and prioritizes rapid discharge." The Australian case study provides a number of critical lessons for Alberta's mental health strategy. The most notable is that acute psychiatric care is an ongoing part of the care continuum. According to Australian psychiatrist Dr. David Copolov, "most people with psychiatric illnesses can, should and wish to be treated in the community…But neuro-biological diseases such as schizophrenia are often enduring, relapsing and serious, and are sometimes life-threatening. For a significant minority, care in the community will, at times, be unable to provide an adequate standard of care. Under such circumstances, admission to hospital should not be considered a sign of failure, any more than admission to hospital after a myocardial infarction should be considered a sign of failure." The experience of the Australian mental health system is a cautionary tale for Alberta, particularly in light of the lack of foresight shown by Plan 246. As Australia has learned, moving beds from dedicated psychiatric hospitals into the community is therapeutically unwise in certain contexts, but it is also philosophically and logistically complex enough to warrant years of consideration and planning, not weeks. Closer to home, the city of Vancouver underwent a significant deinstitutionalization beginning in the 1970s and reaching its apex in the 1990's when the office of the Mental Health Advocate in BC was shut down, significant cuts were made to mental health staff, and the dedicated psychiatric hospital Riverview was closed ( its patients and services distributed--supposedly--throughout the province). It was seen as progressive at the time, but more recently seen as a failure by most, including Premier Gordon Campbell. In January 2008, the Vancouver Police released a report stating that from a policing perspective there has been a clear connection between the mentally ill homeless/criminal population and the drain on public resources such as policing. The key finding of this research is that there is a profound lack of capacity in mental health resources in Vancouver. The result has been "alarmingly high number of calls for police service to incidents that involve mentally ill people in crisis." The human wreckage created by the Australian and Vancouver mistakes can be avoided. However, there are crucial lessons to learn. First, there is a minimum number of acute care psychiatric beds required. Second, complementary services such as therapy, dual diagnosis, rehabilitation and others such as those offered by Alberta Hospital Edmonton guarantee the best mental health outcomes. Last, and most significant, the closure of hospital beds without ensuring adequate community service and community beds is inviting human disaster. Are acute psychiatric beds counts too low in Alberta? Alberta's acute care psychiatric bed counts are low by international standards and when compared to recommended levels. Recent academic research confirms that Alberta's bed levels may already be too low, even prior to further thoughts of deinstitutionalization. This conclusion follows from findings that for certain patient groups the stays may already be too short. According to data uncovered by University of Alberta Nursing Professor, Donna Wilson, younger persons are the highest users of hospital services, and are consistently given a primary diagnosis of mental illness. Readmissions are common, raising the concern that general hospital stays for these younger mental health patients are not long enough to stabilize their illness. General hospitals, in short, are already under pressure from younger high users suffering from acute mental illnesses. Reducing the number of available acute care beds at specialized psychiatric hospitals such as AHE will only increase the already-significant pressure on Alberta's general hospital beds. appropriate housing options are not available. Academic research reinforces this. Donna Wilson's research found an inability of readmitted patients to care for themselves in the community, or for the community to care for them. She concluded that few community options were in place and that patients felt the hospital emergency department was the only resource available to them for a mental health crisis. Dr. Wilson notes that "community-based options may not be as advanced, effective, or accessible as needed by acutely or severely mentally-ill persons… (and) closing psychiatric hospital beds, beds that are used by persons who are at considerable risk of being high users of inpatient and ambulatory hospital care services, would likely have an impact on general public access to all acute care hospital services; including inpatient beds, ERs, outpatient clinics, and day surgery clinics." A society's intrinsic humanity is most accurately measured by the dignity it affords its least fortunate citizens. The deinstitutionalization experiences of other jurisdictions, the current pressure on Alberta's existing hospital resources, and the overall lack of community capacity all indicate that Alberta would be wise to revisit any plans for deinstitutionalization. There is likely never going to be a definitive answer as to whether treating mental illness biologically or existentially, institutionally or in the community, ought to take predominance as a treatment mode, but what is clear is that when the biological treatment of severe mental illness is recommended it is often best pursued in a specialized setting such as AHE. Should a dedicated specialist psychiatric hospital be part of the spectrum of mental health services? Is the community a central part of the spectrum of mental health services? The answer to both, the evidence seems to show, is yes. 1. Redraft plans to refurbish AHE. AHE should be recognized as a well-supported spoke in the wheel of mental health services, with community supports (for every level and type of mental illness) as the hub. 2. Examine the reality of deinstitutionalization for Alberta. All plans for de-hospitalization should be reconsidered and a transparent and representative advisory committee should thoroughly review the implications. 3. Increase the purview and visibility of the Mental Health Patient Advocate. 4. Adjust the structure of Stephen Duckett's compensation. Stephen Duckett's compensation should be restructured to maximize his salary through improved mental health outcomes instead of cost reductions, a structure based on his own academic recommendations for valuing health care performance. 5. Create an accessible mental health patient's Bill of Rights. 6. Increase mental health services. number of psychiatric beds must not be seen as counter-weights, in which adding to one subtracts from the other. Both are vital and require immediate investment. Even a governmental change in attitude such as the above, by no means a given, will not immediately improve the quality of the policy parameters that dedicated mental health sector staff will be asked to operate within. But it is the only place to authentically re-start. Taken together as a new starting point, these and other such real and symbolic actions would signal to persons suffering from a severe mental illness that we have begun to match rhetoric with action.